See the blonde in the back? She's a living prop. Dog Poo: I think I deserve to take Kenny's place the most, because, I've been hanging around these guys for like five years and I never get to say or do anything. Eric Cartman: ...Yeah, I've only seen that kid in class, but he never does anything. He's more like a prop. — South Park, "Professor Chaos"
There's the Recurring Character, appearing more or less often beside the main cast. There's the poor Red Shirt, who is usually introduced only to get killed off in the very same episode, and the Mauve Shirt, who survives longer or at least gets a token amount of characterization before dying. There are the Hero of Another Story and the Bridge Bunnies, who get to actually run the place from time to time while our heroes boldly go where no man has gone before. There's even Spear Carriers, who have a line or two of actual dialogue. And then, below all of those on the plot importance hierarchy, we have the Living Props. They have very few spoken lines, if any at all — it's usually along the lines of "Hot or iced?" or "All systems ready, Captain". If this is noticeable or stretching realism they are Ghost Extras. Most of the time they just stand there in the background, as if they are a permanent part of the scenery that might as well be a living prop. Sometimes, however, they will be subject to Lampshade Hanging about their dedication to their one job, and if this trend continues, they may even transform into a proper Recurring Character, sometimes with their own subplot. Compare and contrast Unknown Character, for a character with plot relevance who was never shown. They might also have been a Chekhov's Gunman the entire time. Or even something more. The reporter from Tokyo Mew Mew actually got into the character popularity poll for the manga, despite having no character and only showing up in a few panels to cover the Magical Girls' exploits on the news. In Sgt. Frog, starting with episode 63, the 24 nameless students of Fuyuki's classroom receive unique designs which are carried over in any classroom scene after that episode. They even appear sometimes outside of classes too. A new extra was added in the 3rd season without any formal introduction. They're never credited or named, even when one of them actually gets a small active role, and, although Fuyuki has mentioned his school friends a few times, he's never shown actually hanging out with any of his classmates. In Mai-HiME, Mai's class consists of a few named characters and a bunch of stable living props. Interestingly, the nameless girl with blue hair who sat in front of her for the whole series ended up being one of the main characters of the sequel/Elseworld, Mai-Otome. In a Mai-Otome picture drama that takes place in the Mai-HiME universe, she lets Arika and Erstin stay at her apartment after they find her cat, Nina. Pandaman from One Piece. Or is it Pandamen? Naruto has a rotating selection of about a half-dozen jonin which have occasionally fought, but most spend their time doing incidental tasks like guard duty and mostly exists just to show that the jonin are in limited numbers. And Tenten, who Word of God says exists only to be the Token Female for Team Guy. Magical Girl Lyrical Nanoha StrikerS makes sneaky use of this character type's ability to be ignored by the audience by having one of these, a girl secretary we're actually shown skittishly edging towards General Regius near the end of the season, turn out to be the disguised cyborg assassin. WORKING!! has Maya Matsumoto. She is seen doing her work and appears in the OP, but has no interaction with anybody from the main cast. She's suspiciously absent during staff meetings and doesn't even seem to talk to her direct superior. That's some job independence there for a waitress, but it seems like there had to be at least one person who actually focuses on the main business. Then in the final episode we learn she is obsessed with being "normal", thus goes out of her way to avoid all the abnormal people she works with. There is also some kitchen staff which never gets any mention. In season 2 of K-On! class 3-2 consists of distinct, individual characters, who can be seen in various scenes of the classroom and in the opening sequence. Several of them have even gained their own fanbase, like Tachibana Himeko, previously known as "The Girl Who Sits Next To Yui". Dead Leaves has the prisoners who escape with Pandy and Retro. None of them are given names or developed as characters, except for Drilldick (which isn't his real name...probably) and his manic man-crush on Retro, but every one is distinctly designed, and there's even noticeable continuity between the ones who get killed in a given fight scene and the ones left standing around afterward. Emiri Kimidori is a living prop in the anime of The Melancholy of Suzumiya Haruhi. The only thing she does in both seasons and the movie is ask for help from the SOS brigade once. She then promptly goes back to being scenery. Marron and Bra in Dragon Ball Z. They serve no other purpose than to show the audience that their parents were Happily Married after long time skips. Marron isn't even credited under her own name in the Japanese version, she's listed as "Kuririn's Daughter." Bra progresses to an extremely minor Satellite Character in Dragon Ball GT, but it's pretty clear that the only reason they're around is because the writers couldn't very well get rid of them. In Gakuen Babysitters, it's almost as if Midori exists purely to show that Usaida is not a complete Lazy Bum and can take care of at least one of the kids. Granted, a lot of this comes from the fact that she's a baby who can't communicate amongst a group of toddlers with basic speech skills, but even the one chapter that's ostensibly about her is actually more about her mother. Invoked in the first Lupin III manga chapter. Lupin has disguised himself as one of the guests in a mansion. Zenigata (and the reader) spends most of the chapter trying to figure out who Lupin is, only to find out at the end that he was that glasses-wearing background character who had, like, two lines of dialogue up to that point. In the Pokémon anime, there are many minor background characters who go on to make appearances throughout the years, or seemingly minor one-shot guests that can be seen in the background of later episodes. This happens even across entire regions. There's a long-haired male trainer with a hoodie and a baseball cap who appeared in episodes from the original Pokémon anime up to Black & White, and he was even in the first movie and the later Mewtwo Returns TV special. All that without ever receiving a name or interacting with the show's main cast. In Puella Magi Madoka Magica, there are a lot of kids in Madoka's class, but most of them don't even have lines except for indistinct background chatter. One of them, however, is nicknamed "Poorfag" for being seen without a laptop in a scene where everyone in the class had their laptops out, and has an entire book's worth of Fanon about her. In Weiß Kreuz, Momoe, the little old lady who supposedly owns the shop the four protagonists work at. In most episodes, if she even appears, she sits quietly in the background, never moving from her rocking chair, petting a cat that's curled up on her lap. She's apparently an agent for Kritiker, as she plays the "deaf old lady" role to the hilt and never responds to questions about where her employees are, even at gunpoint, except to discuss her store's stock. In Legend of Galactic Heroes, due to its massive cast, some characters inevitably end up with this role whose sole purposes were to avoid creating the impressions of an Oddly Small Organization. A good example would be the group of officers in the Yang Fleet who were always present in its high level strategic meetings but rarely (if ever) raise any comments. Sykes in The Intimates is technically a main character, but he's a walking vegetable who never talks. This is due to the Null Field that contains his powerful psychic abilities, which has the side-effect of dampening his thought process. Vitalstatistix's shield bearers in Asterix ...except when they drop him. And when they quit, and are replaced by Asterix and Obelix, and then by Obelix alone, which better suited Vitalstatistix's inclination or lack thereof. Yasha Mousekewitz, the baby in An American Tail, is an example of how baby characters can often become living props. In the later DTV sequels she's hardly ever even shown awake. Most of Nemo's classmates in the class scenes in Finding Nemo. Only a select few of them have any individual speaking lines, if they even speak at all. In the sequel, Tad, Sheldon, and Pearl join them in a particularly big example of Demoted to Extra, remaining completely voiceless outside of speaking in unison with all the other kids. Alfred Hitchcock loved to do this. To himself. Stephanie, Phil's wife in The Hangover and its sequel, has one line in each film & is never named on screen. This applies even more so in the sequel where she spends her brief screentime hovering silently at Phil's shoulder, and her one line comes amid several characters speaking at the same time when Alan runs a speedboat aground & everyone is checking to make sure the guys are okay. Ethan, in the 2007 I Am Legend movie. He is not a speaking role (or an emoting role), but he's there for the second half of the movie, always in the background or foreground. He doesn't do anything, he needs to be rescued a couple times, and his only real reason for being in the movie is so he can watch Shrek shortly after appearing on-screen. No, really. Anchorman: The Legend of Ron Burgundy: Wes Mantooth's Channel 9 Evening News Team cohorts. They stand around behind Wes, but contribute nothing to the verbal argument in the park. Lampshade at the end. Wes Mantooth: What, you guys can't say one thing? Even the guy that can't think said something. You guys just stand there? Come on! W.: In the biographical film of George W. Bush, there is a scene where Bush is berating U.S Army commander Tommy Franks for not finding WMD's. Sitting next to Franks is a British officer (presumably representing Air Marshal Brian Burridge, head of UK Forces) who shifts awkwardly in his chair and looks as if he is going to speak a few times. But he says nothing. Sleepless in Seattle has a particularly notable one, where the living prop is on two different planes from Seattle to New York in the same day. Queen, later Senator, Amidala's assorted handmaidens qualify as living props as their main story function is to follow Amidala around and provide a stylish backdrop for her more flamboyant fashions. Many Jedi in the Prequels, such as those on the council whose name isn't Yoda or Windu . The Runaways is a biopic dramatising the all-female rock group of the same name. Member Jackie Fox refused to let producers adapt her life story, so the film creates a character called Robin to stand in as the fifth member of the band. She gets almost no lines and just appears standing in the background of group shots. Night Of The Living Dead 1961 has very little character for Judy. About the only thing she does in the film is leave the house to go with Tom and Ben, and get her jacket caught in the car, allowing herself and Tom to be killed. The character didn't exist in the first script, but was added in after they met actress Judith Ridley - who was so beautiful and charming they had to have her in the film somehow. The 1990 remake gives Judy much more of a role in the story. In Are You Being Served? there are a couple of other female employees sometimes seen in the background of the ladies' department, but they never talk and never join the others in any departmental meetings. The lift girls and the employees shown at the other tables of the canteen would also qualify. Batman: In a Funny Moment, Large Ham King Tut madly screams his dialogue to the ear of one of the beautiful mute slave girls of his harem. She tries her best not to change her indifferent expression . Most of the deck crew in Battlestar Galactica started out this way, though several were promoted. The tattooed pilot was a particular fan favourite. Big Brother 13 had cast eight completely new people. You would not know this by watching the series. The Bill calls such characters "Totally Reliable Extra Veterans" (TREVs). Buffy the Vampire Slayer did this a few times. Seth Green was just scenery for quite a while before his character Oz was given a name and a bigger role. The regular customers at Cheers whose names are not Norm, Frasier or Cliff. Some of them (such as Paul) were eventually promoted to Recurring Characters. In fact, Cliff was one of these for the first few episodes. One character was referred to in scripts as "The Man Who Said 'Sinatra'" because in his first speaking role...his line was just the response "Sinatra!" Dad's Army: the seven main characters make up only about a third of the troop. The rest are just props. One of them, Private Sponge, gets a few lines and ends up being the Colonel Makepeace of the series. Corporal Bell from the UNIT era Doctor Who. Because the Doctor Who production team used the same stuntmen repeatedly in those days, you would get a recurring group of silent uncredited redshirts. Pat Gorman was one who got bits of dialogue and graduated to credited status near the end of the UNIT era, but even then he was still known as "UNIT Corporal" or "Soldier." One of them, Max Faulkner, appeared in a small capacity as a redshirt UNIT soldier in 1970, but by his next appearance in 1975, had gotten a rank and a last name "Corporal Adams." In Earth 2, seventeen people crash land on G889, and for the entire series, three of them are never given lines. These three are also never or almost never mentioned by name, with the exception of one, whose death is a major plot point in the finale. In some episodes of Everybody Loves Raymond, Ray and Debra's kids come off as living props. There often are entire episodes where they have no lines. Even when they do have parts in the show, they usually only are to start the main plot with the adult cast. The staff (and several customers) of Cafe Nervosa in Frasier. While no waiter lasted the full 11 years of the series, they did tend to stick around for a few of them. Similarly many of the extras portraying customers stayed there for many years. In Friends, Gunther the barista started as one of these, but was elevated to a side character due to jokes based on his crush on Rachel. Larabee of Get Smart started out like this. He began the series as a bystander, then starts doing things Da Chief tells him to do. It wasn't until he's told to Follow That Car that he became a Recurring Character and the Ur-ditz. Brad the Pianist does nothing but play the piano for the kids. Has received several lampshades. Santana: I went through that "Rumours"-album and found that best song that expressed my feelings for you. [beat] My private feelings. Brittany: [Gestures to Brad] What about him? Matt Rutherford and Mike "Other Asian" Chang count as well, at least in the first season. They were generally two of the most skilled dancers on the program, but neither spoke more than a line or two. They ended up going in opposite directions; Matt wasn't named until after several episodes, and then Put on a Bus in the second season, whereas Mike's dancing was featured more and more and eventually became a recurring character and Tina's romantic interest in season 2. Tina herself had become this due to lack of development and complete solos, addressed as a major plot point in an episode aptly titled "Props". The Jazz band. They are always around when needed for a song. In one episode, two of them got to perform in Sectionals on stage with the New Directions. They still did not get any lines, though. Non-fiction example: On Great British Menu, each competing chef is provided with an assistant to, uh, assist. These assistants are on camera throughout the cookery scenes, but are never referred to, and the only time you ever hear them speak is to say "cheers" when the winning chef shares the champagne at the end of the week. Most of the fraternity and sorority members in Greek were this. Very few were given lines, and most of these were in the three main houses of the series; the rest were lucky to get one member with lines. Ricky's band members shown during night club scenes. A literal example — the baby chicks. In The Inbetweeners Carli D'Amato's best friend is a girl name Rachel who plays a small part in one episode and gets one line in the movie ("stalking you abroad") but who otherwise simply hovers silently at Carli's side to show she actually has a friend. JAG: Petty Officer Jason Tiner, the Admiral's yeoman, slowly transisted from this state to a recurring character during seasons 2 to 5. French sitcom Les Filles d'à côté was at least partially set in a gymnasium/health club. Throughout all 180 recorded episodes, it became obvious that the same dozen or so extras (mainly young women in gym kit or swimming costumes) were being cycled through the background in the gym, coffeebar and shop to populate the scene. Deconstructed in Life on Mars (2006) where the workers at an office don't realize that the man who has taken them hostage is the office's handyman. In the early seasons of Lost, the survivors camp consisted of about eight main characters and forty living props. Eventually, a Mauve Shirt lampshaded it by complaining about how clique-ish the main characters were. Regardless, the fans refused to accept the premise that Nikki and Paulo might have been Ascended Extras. They made a great effort of keeping the show's background cast consistent throughout the years. While some faces inevitably came and went, many people kept appearing among the crash survivors for 5 or 6 seasons without any impact on the plot whatsoever. In addition, background cast of more seldom appearing groups (The Others, The Tailies, The Ajira folk) remained consistent as well, people were called over season-long gaps to reprise their brief non-speaking roles. Bobby Draper in Mad Men. On his fourth actor, with only a handful of lines per season in increasing contrast to his big sister. When The Mary Tyler Moore Show was about to be canceled, the staff writers completed a script that was intended to be the very last episode of the series, but which was ultimately not used. In this script, a mad bomber leaves a series of bombs in Minneapolis, and various clues indicate that the bomber is someone in the WJM-TV newsroom. The regular characters all start suspecting each other. The bomber turns out to be one of the dozens of faceless Human Props who were seen along the back wall of the newsroom throughout this series. Some of the minor staff (orderlies, nurses and others) in M*A*S*H probably count as examples. The names "Nurse Able" and "Nurse Baker" are used, but not with any consistency. That is, "Nurse Able" will be one actress in one episode, and a different actress in another episode, even if the first actress is also in this one. Though Able and Baker are also part of the military alphabet at the time meaning Nurse Able and Nurse Baker may have been as much shift titles as anything else. In Mission: Impossible an in-universe example — when Phelps needed to introduce the mark to a phony place of business or hospital, he would often recruit the Hartford Repertory Players to serve as background workers or doctors. Sienna Cammeniti (played by model and 2006 Miss Australia Erin McNaught) was added for the sole purpose of sexing-up the cast and helping boost ratings. It didn't work. Lisa Hayes seemed to exist for the sole purpose of getting dumped by Lucas. The abbreviated six-episode first season of The Office featured several background characters in addition to the speaking cast. By Season 2 the extras were gone. Once Upon a Time: Following the conclusion of the Little Red Riding Hood arc, Granny is usually only seen among crowds of characters telling Emma, Mary Margret, or some other major character about something going on around town. 90% of the students in Saved by the Bell. Same with Boy Meets World. Scrubs has a collection of doctors that regularly appear on screen but (mostly) do not talk. For example, Colonel Doctor (called that because he looks like the Colonel Sanders), Dr. Beardface (It's Be-ARD-fa-SAY! ), Dr. Mickhead, and Snoop Dogg Intern. It's Snoop Dogg attending now. He got promoted. They actually start showing up rather frequently and get jokes in. Several one-shot characters often become minor characters after positive reception. These characters are third tier while the doctors that don't get jokes would be living props. The cashier in the coffee shop in Seinfeld. She was eventually given a name (Ruthie Cohen) and a few lines. The silver-haired detective in The Shield. Never got a line, but he was acknowledged when he got a round of applause for being the first person to use the newly-fixed men's toilets in season four (they broke just before the first ever episode of season 1). Walter Harriman in Stargate SG-1. Originally nicknamed "Chevron Guy" because his only role in the series was to announce Engaging Chevrons, he got a proper name and some involvement in the plot in later seasons. And once Walter started becoming a real person, they introduced Sylvester Siler to be the Prop guy in the background. And then Siler got a name and lines and characterization. Siler: Oh no, not again! Lieutenant Leslie was such a prop that in one episode, he is killed off and later reappears in the background under the assumption that no-one would notice. Despite (or perhaps because of) this, he has his own fan site . Leslie appears in more episodes than Sulu or Chekov, though you could count the number of episodes he has lines in on one hand. Lt. Galloway also fits. Galloway has also kinda sorta returned from the dead; the writers remembered his death in time to change the character's name to "Johnson" at the last minute, but when he appeared again in the final episode, he was credited as Galloway (though not named on camera). There's also Lt. Hadley, who appeared in 62 of the series' 79 episodes (usually filling in for Sulu or Chekov when one of them was unavailable) but never got a single line of dialogue. Miles O'Brien in Star Trek: The Next Generation, who went from being an unimportant helmsman in the show's pilot to a recurring secondary character as a transporter chief and then on to be a major character in Star Trek: Deep Space Nine. Also from DS9: Morn, the silent, morose-looking alien extra perpetually stationed at the far end of Quark's bar, who seemed so profoundly dedicated to doing nothing at all that he actually became the center of fan attention. Morn even got his own episode ("Who Mourns For Morn?") and was still an uncredited extra with no lines! The Running Gag being that when Morn is not on camera, he's the life of the party. The viewers just never get to experience it. Voyager has Lt. Ayala, a regular extra who appeared in all seven seasons. Formerly one of Chakotay's Maquis crew, he can often be seen filling in for Tuvok or Harry. We know a fair bit about him, but not from his mouth — in 115 episodes, he had only four lines. Survivor has had this happen in seasons with very poor editing. In Samoa and One World, the season winner could have been called a Living Prop. Infamously, Survivor: Nicaragua contestant "Purple" Kelly Shinn was virtually invisible for half the season despite finishing in eighth place out of twenty. She did quit the game instead of being voted out normally, but that doesn't excuse the fact that other quitters have been edited more favorably. Jeff, Louie's assistant on Taxi, the only black character on the show. Nick @ Nite once chronicled his rise from just lurking in the background, to getting a couple of lines here and there, to having the occasional subplot and a single episode in the limelight. On 30 Rock, most of the TGS writers. Only Liz, Frank, Toofer and occasionally Lutz have sizable parts. Another writer is lucky enough to have the recurring name of Female Writer. Who was eventually given the full name of Sue LaRoche-Van der Hout when a joke called for someone to be offended in French and Dutch at the same time. Liz actually addresses them as "ones who don't talk" on one occasion. In another episode, one of them said a line and then gasped "I did it! I talked!" The finale has one say "I know I don't talk that much, but..."
Victorious: Lampshaded in "Creepy Ponnie" when Ponnie claims to be one of the students who don't say anything and only shrug ("shruggers", as Tori calls them). When Tori asks them if they know Ponnie, they only shrug. 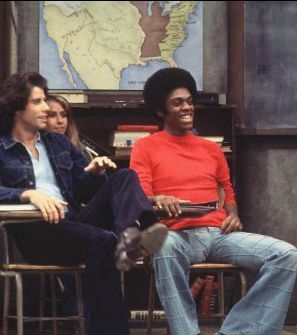 All of the other members of the Sweathogs' class in Welcome Back, Kotter. They were there simply because a high school class of only five students, especially in Brooklyn, would be unbelievable. The students in Justin's delinquent class on Wizards of Waverly Place that aren't Alex, Felix, or Nelvis. They never speak and are not credited for their appearances. The Young Ones had a "fifth roommate", a long-haired hippie-like figure who is seen sitting on the floor in some scenes. Seen here. In Dale Messick's comic strip Brenda Starr, most of the scenes in the newsroom featured a lot of anonymous characters in the background while Brenda was the center of attention. For several years, Messick included in background panels a female staffer with a distinctive topknot and glasses, but this character was unnamed and had no dialogue. Abruptly, Messick wrote a continuity in which this character  suddenly identified as Lucy Fixture  won a fortune in the sweepstakes and had an adventure of her own before vanishing from the strip. A Jobber will often be this. Most jobbers will only be around to get beaten by more prominent wrestlers and add bodies to huge fights. A jobber that fits this rarely if ever say anything and will only win a match if they're either facing another jobber (in which case, the promotion will definitely not bother televising that match) or if they're getting a push. Some 6-man or 8-man tag team matches will have a partner who doesn't get tagged in or only gets a quick spot at the start or end. TNA had So Cal Val who sat at ringside to be Ms. Fanservice and seemed to serve as timekeeper and occasional ring announcer. She briefly hosted a web series called Pillow Talk. Invoked in Japanese theatre. The stagehands in western theatre would normally be offstage most of the time, only showing up if there was a Special Effect Failure or serious accident. In contrast, Japanese theatre had the stagehands be visible a lot more, and they would dress in a black suit and wear a mask that only showed their eyes...sound familiar? Thus, the audience was trained to ignore the people in black suits...and then would jump in shock when one of those living props draws a weapon and "kills" one of the characters. The Poopsmith is usually a Living Prop. Though he has taken a vow of silence and shovels crap for a living, so it's understandable why he isn't all that important. Also, in the 20X6 mock-Japanese 'spin-off', Pan Pan and Cheatball. Pan Pan really only serves to show that 1-Up isn't a loner, and Cheatball really is treated as a prop! The Cro-Marmot from Happy Tree Friends who shows up occasionally. Schlock Mercenary: Several of the background members of Tagon's Toughs spend most of their time as this. In the background but rarely having a major impact on the story but many of the non-humans are instantly recognisable due to their distinct profiles. Some of them (Andy, Legs, Elizabeth) are more Recurring Characters but default back to this between their times in the lime light. The Amazing World of Gumball generally defies this trope, as there have been episodes focusing not only on almost all of the recurring characters, but also on the unnamed extras and even the inanimate objects, with the exception of Rob the Cyclops. He's been in Gumball's class since the early reel, yet he has no personality, has never played an important role in any of the plots, and has only spoken once over the entire run of the show so far. Lampshaded in "The Pony", in which he gets offended when Gumball and Darwin get his name wrong, so Darwin pushes him into a sewer. Gumball: I cannot believe you just did that! In the third season finale, Rob decides to get even for his mistreatment and vows to become Gumball and Darwin's nemesis. His next appearance shows that he hasn't been particularly good at it. There are a number of such characters in Arthur, mostly recurring townspeople and the students in D.W.'s class. Like a pair of rabbit kids who've been in Arthur's class since season 1, but are not as developed as their classmates (in 20 seasons, the male one has only talked twice, the female one hadn't talked at all until season 20). MacFrensky had a class list with the names (Alex & Maria) on it, but some fans refuse to believe those are their names, since Arthur has had several other one-shot classmates over the years (never mind that the two rabbits were the only other two kids besides the already named regulars shown in class in that episode). Arthur also deserves special mention for having promoted some of their former Living Props to actual named, voiced characters. Fern, George, and Jenna have all been present in Arthur's classroom since the beginning. This trope was retroactively justified by all three turning out to be shy, introverted, or both. In George's case, it's even lampshaded by the others having only ever known him as "that shy, goofy kid with the big horns." The female rabbit kid would get her very own episode, which not only revealed that she really is named "Maria" but the reason why she didn't talk at all before: She has a chronic stutter and is working on improving that. The other village leaders besides Raanu in BIONICLE: The Legend Reborn are just there to show that the other villages have leaders who attend arena matches too, but Raanu's the only one who does anything. In fact, Tajun's supposed leader doesn't even react at all to the news of his village's destruction. A Walrus and few of his friends from Camp Lazlo have also been in the background. There is an episode that lampshades this and gives the walrus a day in the limelight. Many of the kids in Clarence, but Gilben, the square-headed kid with curly hair and a blank expression on his face, takes it to its logical extreme. Except for a few of the early episodes, he never moves onscreen, as if he were little more than a mannequin. This is highlighted in the few times he's been put front and center, where he retains his immobility while other characters still act as if he were moving, even reacting to what he's "saying" even though nothing is heard. Codename: Kids Next Door has several kids that are seen often in the series, but rarely they serve other purpose than to be victims of the episode's villain. There are exceptions, like Eggbert who becomes class president and Leona who is Really 700 Years Old. A number of the show's supervillains also fill that role. Examples include the Iguana, Bright Idea, and Teen Tornado. Most of the students in Casper High in Danny Phantom are usually the same students that randomly waltz around the school to keep its consistency. At times, a few will barge in and deliver one line before pushed to obscurity once more. Most of Daria and Jane's classmates. A lot of them have interesting designs, however, and thus get a lot of Fanon or O.C. Stand-in roles. Downplayed in Foster's Home for Imaginary Friends. Every resident who isn't in the main cast is a living prop, yet the creators of the show take the time to name them all, even going so far as to write a small paragraph about a dozen or so of them in the season 1 DVD. Freakazoid! has Emmitt Nervend, a strange guy who shows up in odd places and just stands there. Most likely the ultimate living prop. Except for that one time where he's a salty dance hall chanteuse. The Number Nine Guy in Futurama has a number of background appearances in the series until he finally has an actual role in the fourth DVD movie. Word of God says that he was originally supposed to become important when the show was going to be more dystopian (the "9" being his rank in a Fantastic Caste System), but he remained in the background when their plans changed. Lampshaded as the main plot of two episodes of Harvey Birdman, Attorney at Law, in an ironic effort to draw attention away from a small blunder he made, Harvey points out the fact that one of the jurors was in some of his previous trials. This not only forces a mistrial, but it soon leads to Judge Mentok noticing that the ENTIRE jury was in every single episode, so Harvey's entire legal career has to be done all over again. In Iron Man: Armored Adventures, most of the students are only there as living props seen walking around the main cast at school. Several people from Kim Possible, like the blond guy with spiky hair and Ned from Buenos Nachos. Or the girl with a blue shirt that appears like everywhere anytime. In the Grand Finale she even appeared twice in the same screen, thus making Fanon speculate that she has a twin sister. One background character who fit the stereotype of a butch lesbian earned the Fan Nickname "Alex Sapphic." Eventually she was seen standing with another random extra, deemed her girlfriend "Leslie Bean." When the Justice League expanded in Justice League Unlimited, many of the new additions were essentially living props. Characters like Sand, Obsidian, Hourman, and Nemesis did little but hang around in the background and participate in battle royales. Tim from The Magic School Bus, even by The Generic Guy standards. He usually just sits or stands around, occasionally drawing what he sees (which is even more superfluous than it sounds), making very few useful observations, and never "learning" anything from his experiences. On Making Fiends, Charlotte and Vendetta's classmates include Marvin, Marion, Maggie, Malachi, and three other kids that they don't interact with. The first one is Mort, a dark blue boy with glasses, who is seen very often, but doesn't do anything. According to his Nick bio, he's extremely friendly and gives out nonsensical advice. He also has an irrational fear of soda, but a strange and tragic love of soda cans. The second kid is a pink unnamed girl with clips in her hair that is often seen screaming and waving her arms, and the last one is a blue boy with a baseball cap. Moral Orel: When Orel is shown hanging with friends such as Doughy, Tommy or Joe, there's this one unnamed kid who's essentially there to take up space. The fact that his name is unrevealed and he's not especially distinct is a Running Gag. The usual ensemble of background ponies in My Little Pony: Friendship Is Magic. Of course, the fandom gives them all names and backstories. The tendency for familiar faces to show up in new settings has not gone unnoticed by the fans. When the main cast visit the frontier town Appeloosa, half of the locals are regular Ponyvillians in big hats. After Trixie had her reputation destroyed by the Ursa Minor incidents, the images she shows of her later attempts to reestablish herself imply that Bon Bon (a fan favorite background pony) followed her all over Equestria to make fun of her at every opportunity. In Sanjay and Craig, there are several recognizable kid characters that show up in background roles and crowd scenes every now and then. The most common ones include a redheaded girl in a light pink dress and purple boots, and a ginger-haired boy who wears a green shirt. Both the two kids are unnamed, and notably make an appearance in the episode "Muscle C.O.P.S. ", at the beginning of the episode. Not surprisingly, The Simpsons has a few. Maggie Simpson has been this in most of her appearances in the series. Wendell Borton—the pale and queasy kid in Bart's class—rarely has lines, much less an impact on the plot (though this may more be a case of Demoted to Extra, as they had a few lines early on). The example is also lampshaded at one point when even he can't remember which kid is which. Chief Wiggum: Lou, you're the new Chief. Eddie, you're the new Lou. Eddie: Who's the new Eddie? Chief Wiggum: We don't need an Eddie. Those two guys at Moe's bar. No, not Homer and Barney. And no, not Lenny and Carl either, those other two guys. For the record, they're called Sam and Larry. Sam (cap) gets a few lines in early episodes, Larry (balding)... not such luck. Some one-shot characters like Allison Taylor and Jessica Lovejoy that, after their introduction, can be later seen as a background character in many episodes revolving around the Springfield children. Jessica also appears in the new opening sequence, playing the flute in the school's music class. Kumiko, the Japanese Comic Book Guy's wife. Many of the main cast's classmates. Some characters, like Butters, used to be Living Props before becoming major players. Butters was promoted to a major character to replace Kenny, whom the creators recognized as a Living Prop whose interaction with the other characters was limited at best. Unlike Ike or Shelly, Kenny's brother Kevin never really got much characterization, mostly just staying silent in the rare McCormick family scene that includes him. Kind of highlighted by the fact that in later episodes the two randomly have a younger sister who avoids this trope. In Spider-Man: The New Animated Series (the short-lived CGI MTV series), the budgetary limitations forced the animators to reuse certain character models as extras over and over again, sometimes in very different context. Lampshaded in the DVD extras. SpongeBob SquarePants uses many of the same background characters, but except for a few, like the surfer fish, they have a different voice every time. In the T.U.F.F. Puppy episode "Cruisin' for a Bruisin", there was an additional henchman of Snaptrap, who happens to be a skunk. He is rarely acknowledged, never talks, and only does what Snaptrap tells his henchmen to do. He only appeared in that episode, and is never seen or mentioned again. The Venture Bros. has a ridiculously small stable of civilian background characters, leading to many of them popping up in places that make no sense in context with the last time we saw them. The number of villainous background characters is similarly small, leading to a lot of familiar faces whenever a main villain throws a party or show up to an event. Publick and Hammer spend much of the commentaries bemoaning this. Winx Club has the fairies of Alfea that are learning there. They are used for classroom and big battle scenes, and not much else. Some of them, such as minor character Amaryl, are apparently still attending Alfea years after they should have graduated.